TLDR: If you’re running 5E, you need to buy this book. When I heard that the next book in the 5E lineup was Volo’s Guide to Monsters, I was a little disappointed. I’ve never been much of a Forgotten Realms fan, and Volo’s Guide sounded like it was going to be a fluff piece with articles similar to the old Dragon Magazine “Ecology” pieces. While that’s great for magazine content, I didn’t get too excited about the prospect of a $45 book with minimal new information. Fortunately for me, Wizards really outdid themselves in packaging a variety of things in this book that make it a very valuable addition to my growing 5E collection. Disclaimer: Wizards of the Coast does not vouch for, guarantee, or provide any promise regarding the validity of the information provided in this volume by Volothamp Geddarm. Do not trust Volo. Do not go on quests offered by Volo. Do not listen to Volo. Avoid being seen with him for risk of guilt by association. If Volo appears in your campaign, your DM is undoubtedly trying to kill your character in a manner that can be blamed on your own actions. The DM is probably trying to do that anyway, but with Volo’s appearance, you know for sure. We’re not convinced that Elminster’s commentary is all that trustworthy either, but he turned us into flumphs last time we mentioned him in one of these disclaimers. I enjoy the fact that wizards is having fun with this volume, and it made me enjoy getting into the book a bit more than if I hadn’t noticed it. I also appreciate Wizards sold a special limited edition FLGS cover for only $5 more (pictured above) to help the local shops get a leg up. The book is broken into three parts: Monster Lore, Character Races, and a Bestiary. Monster Lore, the first 100 pages of the book, is what I had expected, but some crunch where I otherwise expected fluff for lifestyles of Beholders, Giants, Gnolls, Goblinoids, Hags, Kobolds, Mindflayers, Orcs and Yuan-Ti. Examples of neat details that might constitute crunch include beholder charts detailing size, shape, texture, and a great random name generator, with tactics, variant eyestalk abilities, minions, treasure and a lair map. History, mindset, and biological function is laid out in a depth previously unvisited in text as far as I’m aware, allowing the GM a deeper background on this favorite of monsters. The Chapters going forth are what I’d call asymmetrical, being that they don’t follow a routine pattern. Chapters on Giants have more details about origins, their habitat and personality traits. Gnolls have details on tactics, random traits and features, and tables to help build a gnollish warband. Mind Flayers have some magic items listed that are specific to their culture. Yuan-ti have a variety of charts detailing their variable physiology. Each race detailed has a map of their typical lair, which gives some great examples where the trappings of the race might be otherwise somewhat mysterious (Mind-Flayers in particular). Overall, these chapters are well written and flesh out the background of these common and popular monsters. Is it essential? No. Is it helpful? Yes. My fear had been that for $45.00 I was going to get that, and that be it. Fortunately, it goes on. Now we start to hit things I can work with, and things that people invariably try to do on their own with varying degrees of success. I happen to currently be playing a kobold priest of Kurtulmak in our Out of the Abyss game, and have been playing a kobold trapper race variant my GM got off the internet somewhere. I yearned for canon guidance on what a kobold PC should look like. Fortunately, Volo delivers. Races detailed are Aasimar, Firbolgs, Goliaths, Kenku, Lizardfolk, Tabaxi, and Tritons with a separate section for “Monstrous Adventurers” giving blocks for the already detailed bugbear, goblin, hobgoblin, kobold, orc and yuan-ti pureblood. I’ve always been a guy that likes the idea of playing the monster as a PC, and this opens doors for me. Also a number of “Beasts” (including a rot grub swarm) and 21 new stock NPCs which are sure to prove super useful on an ongoing basis (in particular, it appears a mage of each spell casting school, archers, archdruid, war priest and so on). Not mentioned in my list are also special “classed” versions of various orcs, yuan-ti, hobgoblins, and so on, as well as some subcategories of other races like beholders that will prove useful in putting on games that utilize those species. This is where the book proves out its crunchiness but give me stat blocks that I can use to have a more interesting game. Wizards has done a good job of bringing a little more than just the basics to each book it has published. Each adventure module has had a few spells and a few more general stat blocks that make each book tempting to pick up. This book, as a sourcebook, doubles down on that principle making there elements that you just can’t afford to miss. This book has extended value for the GM of your group, but remains optional for the player short of playing a racial variant. That said, I think anyone who picks it up is going to find it’s a great addition to their collection. 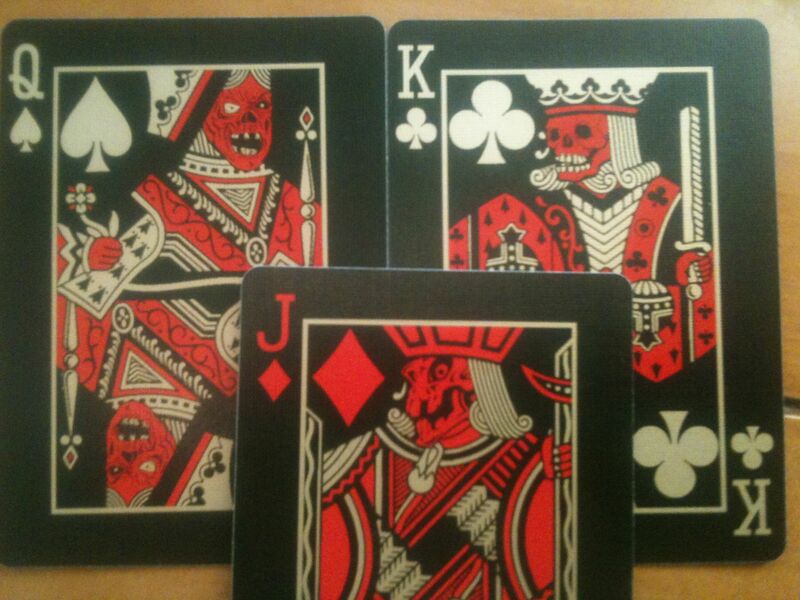 Back in May I pledged $5 on a kickstarter for what looked to be a cool set of slightly evil-looking playing cards. Little did I know, I was witnessing the birth of a custom playing card company. Russell Kercheval, of what is now Circle City Cards, ran a very impressive kickstarter campaign, and has launched a successful company from it. Russell did a great job of keeping his pledgers informed of the ups and downs in the process, and offered some really great rewards for his initial kickstarter. His first deck, Brimstone, is a very unique and striking set of cards. 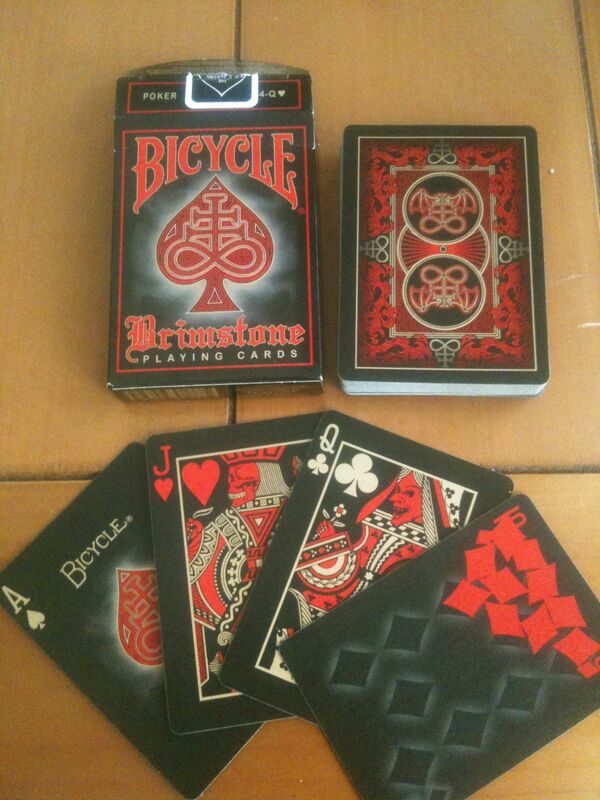 According to the project’s site, the cards of Bicycle’s “magic finish,” which I imagine refers to the texture and gloss of the cards, making card tricks easier to do with them. I didn’t purchase these to do any sleight of hand, but I could see how they would be awesome for that, as they are very eye-catching and have a really nice feel to them. Included were several “gaff” cards that could be used in particular tricks, like the 10 of diamonds with all the diamonds at the bottom of the card, and a Joker that is holding a 3 of clubs. The box itself has 3-of-clubs written beneath the barcode, which I’m sure could be an excellent reveal for some trick. Box and back art. 10D gaff card. The cards themselves are of the highest quality. The art is finely detailed, and the colors on the cards are rich. My wife and I played a couple of hands of Kings in the Corner with them right around Halloween, while watching scary movies. They were perfect for that time of year. From a RPG perspective, they could be used as an excellent prop if the party came across a fortune-teller, or to use as a deck of many things. If you drew a face card looking like these do, I doubt the party would be in for anything good. I would certainly recommend this deck if you like the aesthetic. The decks are reasonably priced for the quality of product you receive, and have a unique look you certainly won’t find anywhere else. 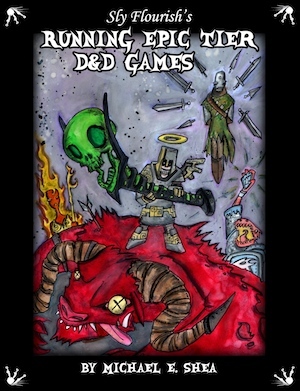 Another member of Skyland games has bid on his latest kickstarter deck, Americana. Sadly, you’ve missed your chance to get in on that one as that project is now successfully funded. We’ll let you know how that one turned out, once it arrives. Keep an eye out for future decks. These guys do great work! A must-have for running epic level games! Fourth Edition D&D has been out for long enough that many players with a steady game may be hitting 21st level. In one of my gaming groups we started the Scales of War adventure path at 10th level two years ago, and are now 25th level. Epic games and even late-Paragon games can be a challenge to both play and run. Sly Flourish’s “Running Epic Tier D&D Games” is an excellent purchase full of tips to keep Epic level play from becoming epically long gaming sessions. It is chock-full of great tips about keeping things exciting while navigating thru the myriad of options available at Epic Level. I purchased the PDF version ($3.99) which included a small format (iPhone), large format (iPad or computer) and ePub formats. It was really a classy move to include all those formats to allow for easy reading on any device. If you are considering DMing an epic campaign I would highly recommend you purchase these tips. Weighing in at 49 pages, it isn’t epically long, but it gets you in the right mindset to take 4th edition to the ultimate level. It includes campaign ideas, encounter tips, and advice about preparing for massive encounters. From our experience with Scales of War it can be very difficult to balance encounters. This book gives the excellent advice of throwing the XP budget concept from the Dungeon Master’s Guide out the window. It just doesn’t apply once the party becomes that powerful. Epic can be fun, but it certainly isn’t for those who are new to D&D. By the time you get to 21st level, the amount of feats and powers on the character sheet can be intimidating to even seasoned players. One important piece of advice is to try and choose options that are easy to remember. Choosing an option which only comes up once in a great while will be impossible to remember in the midst of an encounter. For my most recent character I actually took a highlighter to my character sheet and wrote in little notes about situational bonuses so I could remember at a glance what will apply. I also highlighted whether the power was an Immediate Interrupt or an Immediate Reaction so I can find those powers when appropriate. Have fun with Epic Level play, but don’t go in unprepared! Good gaming to you!